Single program, multiple data (SPMD) parallelism. Multiple program, multiple data (MPMD) parallelism. Analyze and visualize large datasets (that could be remote and/or distributed) interactively using IPython and tools like matplotlib/TVTK. At the SciPy 2011 conference in Austin, Min Ragan-Kelley presented a complete 4-hour tutorial on the use of these features, and all the materials for the tutorial are now available online. That tutorial provides an excellent, hands-on oriented complement to the reference documentation presented here. These components live in the IPython.parallel package and are installed with IPython. They do, however, have additional dependencies that must be installed. For more information, see our installation documentation. The IPython engine is a Python instance that takes Python commands over a network connection. Eventually, the IPython engine will be a full IPython interpreter, but for now, it is a regular Python interpreter. The engine can also handle incoming and outgoing Python objects sent over a network connection. When multiple engines are started, parallel and distributed computing becomes possible. An important feature of an IPython engine is that it blocks while user code is being executed. Read on for how the IPython controller solves this problem to expose a clean asynchronous API to the user. The IPython controller processes provide an interface for working with a set of engines. At a general level, the controller is a collection of processes to which IPython engines and clients can connect. 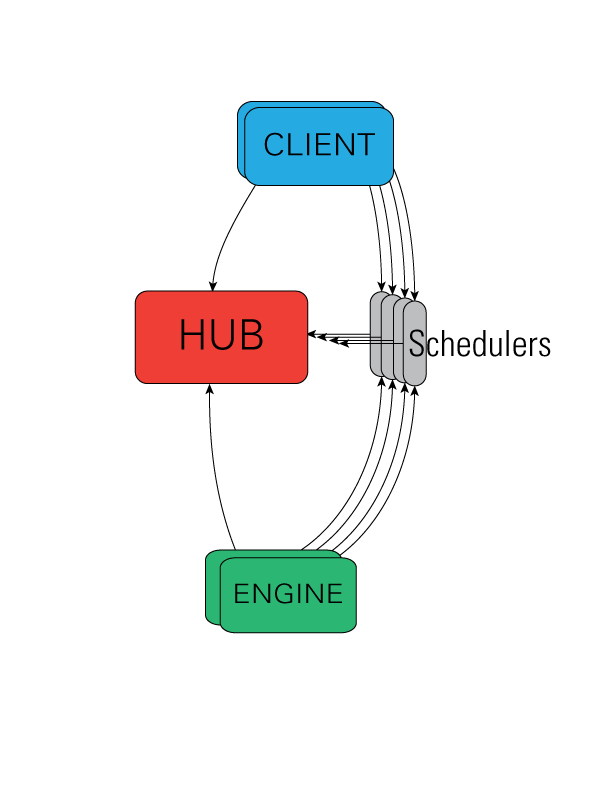 The controller is composed of a Hub and a collection of Schedulers. These Schedulers are typically run in separate processes but on the same machine as the Hub, but can be run anywhere from local threads or on remote machines. A Direct interface, where engines are addressed explicitly. A LoadBalanced interface, where the Scheduler is trusted with assigning work to appropriate engines. IPython uses ZeroMQ for networking, which has provided many advantages, but one of the setbacks is its utter lack of security [ZeroMQ]. By default, no IPython connections are encrypted, but open ports only listen on localhost. The only source of security for IPython is via ssh-tunnel. IPython supports both shell ( openssh ) and paramiko based tunnels for connections. There is a key necessary to submit requests, but due to the lack of encryption, it does not provide significant security if loopback traffic is compromised. To connect and authenticate to the controller an engine or client needs some information that the controller has stored in a JSON file. Thus, the JSON files need to be copied to a location where the clients and engines can find them. Typically, this is the ~/.ipython/profile_default/security directory on the host where the client/engine is running (which could be a different host than the controller). Once the JSON files are copied over, everything should work fine. Even at its most secure, the Controller listens on ports on localhost, and every time you make a tunnel, you open a localhost port on the connecting machine that points to the Controller. If localhost on the Controller’s machine, or the machine of any client or engine, is untrusted, then your Controller is insecure. There is no way around this with ZeroMQ. © Copyright 2008, The IPython Development Team. Last updated on Apr 21, 2012. Created using Sphinx 1.0.7.